We have been manufacturing truck bullbars over 20 years. Compared to our competitors, our products are always made from stainless steel. We take part of different shows in different European countries. First one this year was held in Denmark, in Herning, 21-23 March. This is the largest Scandinavian transportation shows. We have been manufacturing wheelcovers for over 20 years, over 1 million units. Our units are fitted to different truck and bus manufacturers but we also manufacture non OE units. From our lineup you can find front wheel covers but also rear axle caps, both open and closed, perforated and non perforated, in different heights and also with opening for TPS (tyre pressure system). We also offer possibility to stamp your own logo on the covers. We have been manufacturing rear ladders for some time now. We are happy to inform you, that we now have it also for Iveco Daily - most important, fitment is drill free. Obviously you can find eurobar for Daily also. For the last 20 years, Metec has taken part in the biggest automotive fair in Hannover for more times than you can count on your two hands. 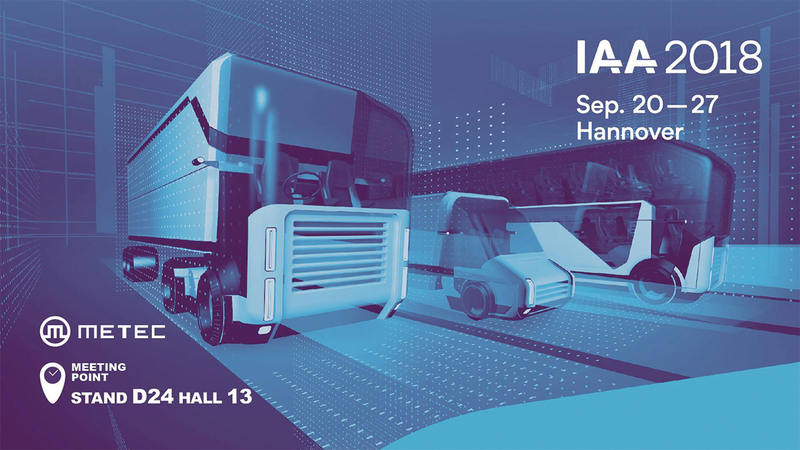 The IAA fair occurs at two years interval. If in the previous years we participated as a co-exporter at our cooperation partners then the last 3 years Metec has been in Hannover with its own fair box office. See for yourself how our box office looks like this year and look back weather you remember our previous appearances!